A number of Sicilian towns have claimed that they were paid a visit by St Paul after he left Malta but it is difficult to verify this. Our only written source is the Bible, which says that after Malta St Paul and St Luke landed in Sicily and stayed there for three days. 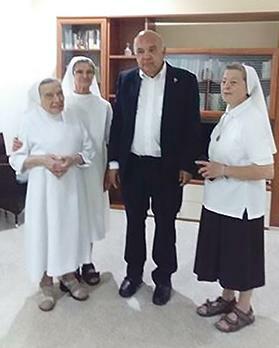 The author with three Maltese nuns: there has always been a convent of Maltese nuns in Solarino. The saint’s stay in Malta has always fascinated me but very little information is given from there onwards. Maybe Luke and Paul went their own ways from Syracuse onwards? Whatever happened, it is difficult to understand how Sicily, such an important part of the Empire, is dismissed in just three days. In any case, tradition tells us that St Paul visited Palazzolo Acreide (the old Akrai), a very important centre at the time, and Solarino. (There are other claims). These traditions are very strong and remembered with great pomp each year. 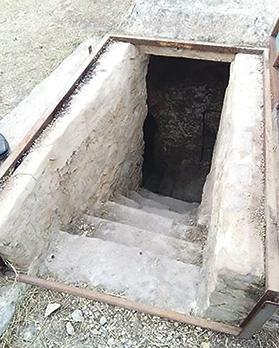 The visit to Solarino is mainly linked with the presence of an old well, which is a place of pilgrimage. Up to Fascist times, the official name of the city was San Paolo Solarino, but the reference to St Paul was removed. (Some today want to reinstate the name.) It is only about 17 kilometres from Syracuse, so it is possible that St Paul visited during his three-day stay there. Most of the historic core of the city has been destroyed over the years but there are still some important historic buildings. The Main Church itself, dedicated to St Paul, is only from the middle of the 18th century. The entrance to the wells of St Paul. An area in Solarino, known as the Maltese quarter, has long been abandoned. Some of the locals carry a Maltese surname. The city always had a convent of Maltese nuns. At the moment there are three. The city is a pleasure to visit and the food is excellent. One of the strongest traditions is that those born on January 25 have the power to cure against serpent venom. These are known as I ciarauli. The only structure that traditionally links the sweet city of Solarino to St Paul is the existing archaeological site (much of which has yet to be excavated) of the wells of St Paul. This consists of the ruins of a Byzantine chapel, steps going down to a well, which is unfortunately full of stone debris, and an area made up of rocks next to it where, it is said, serpents like to leave their old skin and emerge as new. [When I was last there, there were two long serpent skins.] Of course, it is only folklore and traditions that link this area to St Paul, yet visitors do feel they are in a very special place when they’re there. It is a pity there aren’t more archaeological studies carried out in the area.